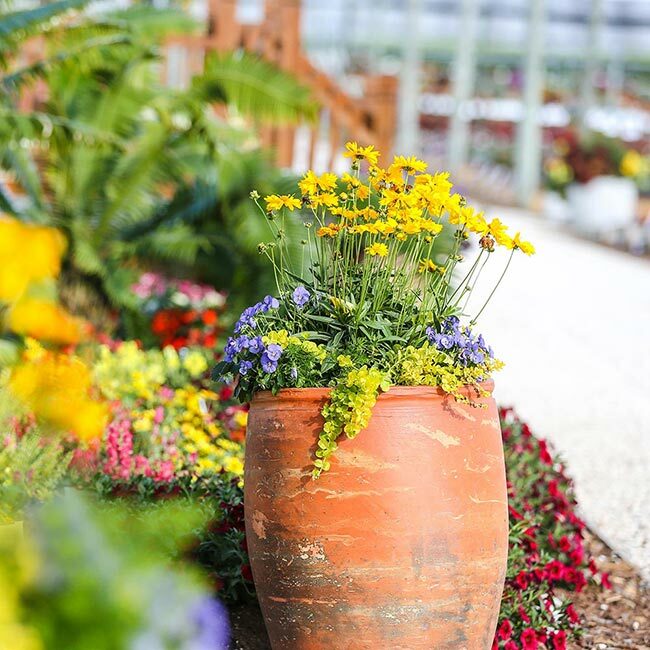 When spring hits and we rush to the garden center to fill planters on our porches, decks, and patios, we typically focus on annuals like petunia, geranium, and calibrachoa. Many annuals flower nonstop and you can get tried-and-true favorites in just about every color you can imagine. But don't overlook perennials. 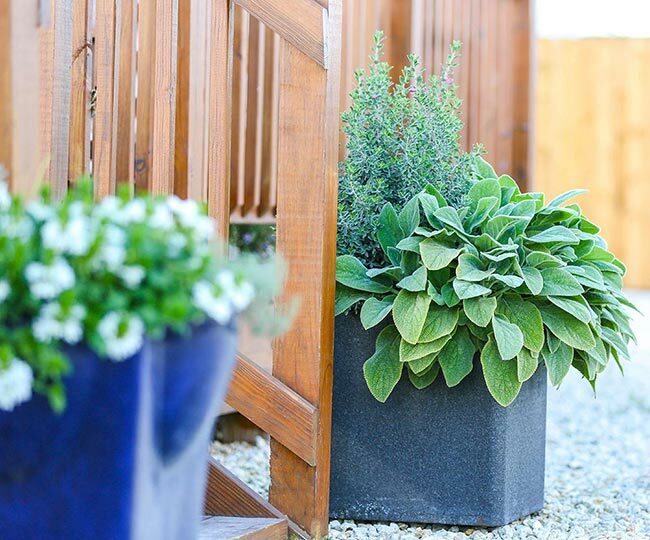 Many perennials thrive in container gardens, too. And at the end of the season, you can pop them out of the pots and into your landscape, where they can continue to thrive for years. I've also found that perennials are a little tougher than many annuals, giving them the ability to hold up better if the container dries out a little or you have hotter-than-usual weather. Here are some container gardens I put together in the Costa Farms Trial Garden to give you ideas and inspiration. Coreopsis is a classic perennial for sunny borders. Most types are North American natives and tough as nails, so they hold up through even the worst weather. While many older varieties bloom for just a few weeks, newer types keep going and going. Here, I paired a golden-yellow coreopsis with annual viola and golden creeping Jenny (Lysimachia nummularia 'Goldilocks'). I've always loved blue fescue (Festuca glauca) because it's such a tidy, textural mound. 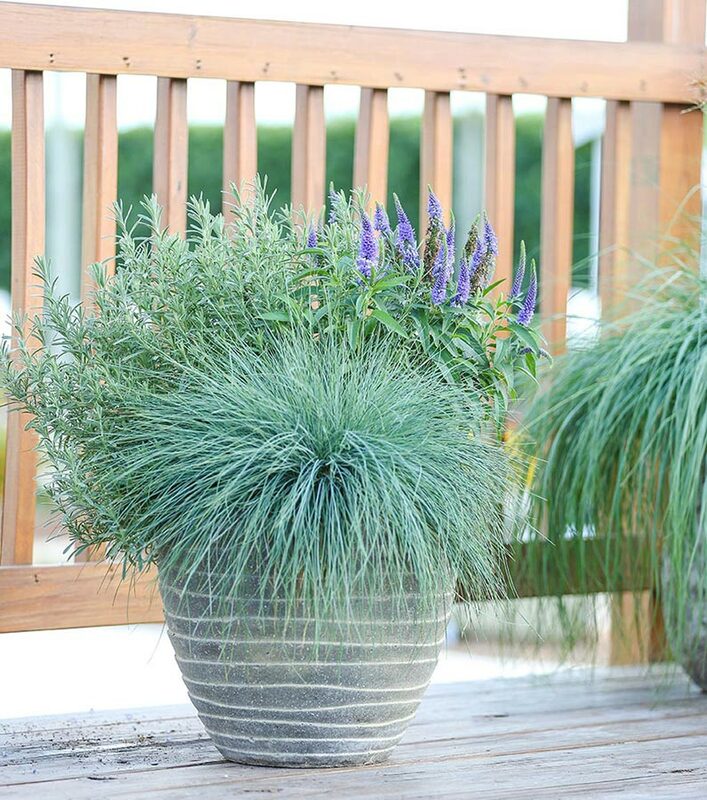 It's as lovely in pots as it is landscapes, so in this container, I paired it with lavender (Lavandula angustifolia 'Hidcote') and Veronica 'Vernique Shining Sea'. The lavender offers a different texture, as well as its pleasing fragrance, and the veronica spikes help draw the eye up and bring more contrast into the planting. If you're like me, you probably enjoy container gardens that don't need watering every day during the hottest part of the summer. I dealt with that by putting together this combo of lamb's ear (Stachys byzantina) with Texas sage (Leucophyllum frutescens), a subtropical shrub with similarly silver foliage and airy lavender-purple flowers. Both plants thrive in hot, dry weather. If mixing plants seems more complicated than you'd like, take the stress out by selecting just one perennial for your pots. I did that here with pincushion flower (Scabiosa 'Butterfly Blue'), a perennial that blooms nonstop from spring to fall, especially if you cut the old flowers off as they fade. This plant is also one of the best for attracting butterflies, bees, and other pollinators! If you have shade, try mixing houseplants with your favorite perennials. Here, for example, you can see how stunning coralbells (Heuchera) looks with Aglaonema 'White Calcite'. 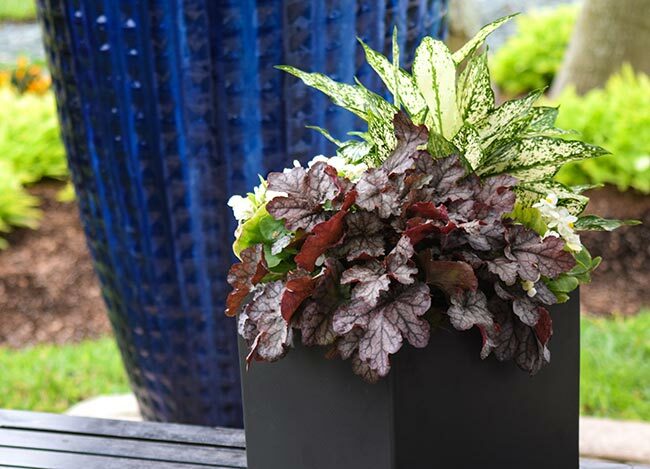 Once fall comes, pop your heuchera into your shade garden and your Aglaonema inside so you can enjoy the easy-care nature of this indoor plant. Looking for more? 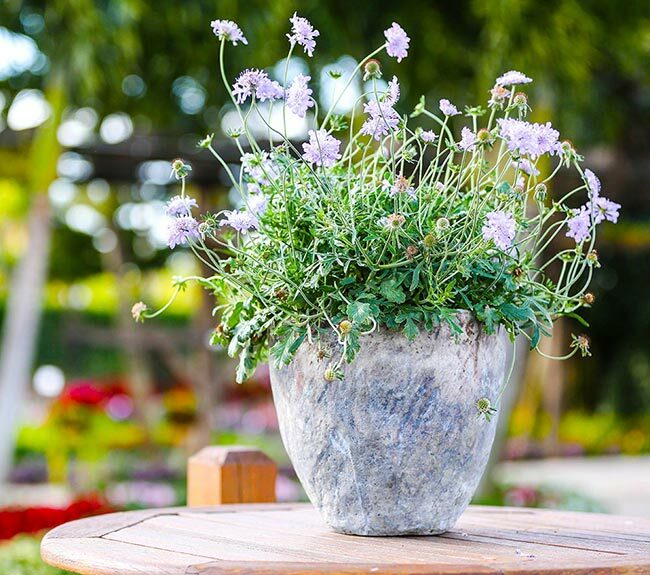 Check out Costa Farms' other container gardening ideas.